Ed Note: This piece will eventually be cross-posted with a blog I write for from time to time, Planet Forward. That’s the reason it has a noticeable environmental slant and a little more news-y style, which is not my norm. Although you can fish for salmon in the Great Lakes, us Midwesterners consider them a delicacy. Restaurants fly them in daily from as close as the Eastern Seaboard and as far as Norway. Rarely ever do we get to eat a Lake Michigan salmon—especially at a fair price. I grew up hearing the legends of my grandfather catching salmon in the northern reaches of Lake Michigan, a byproduct of an intense Great Lakes fisheries initiative. The first stocking of the lakes happened forty years ago, long enough to establish the salmon as another part of the Great Lakes ecosystem. The revitalized salmon population comes as a direct result of Milwaukee’s watershed cleanup plan. City officials have been constructing green roof, setting up rain barrels and buffering watersheds to stop toxic runoff before it pollutes the freshwater. These techniques have allowed the river ecosystem to reestablish itself, and the wildlife is returning. Very simple cleanup plans like these are finding success across the nation. I recently spoke to someone from Groundworks Anacostia about the cleaning up the Anacostia River and the surrounding watersheds. Groundworks places bandalog litter traps at compromised points of the Anacostia River to soak up refuse before it infiltrates the river. We got to talking about river health and wildlife, and he mentioned a beaver had recently been spotted down the river from the DC watershed making a dam. There are few better signs of ecosystem health than wildlife returning and settling to a region. But we have to ask the question: Why did the wildlife leave in the first place? Obvious answers would be habitat compromised by polluted watersheds (in Milwaukee, concrete fortifies the Kinnickinnic at points, which I find confusing to say the least). Viewed through a more theoretical lens, the health of certain species of wildlife pertains to the preservation of their umwelt—an extension of an organism’s own personal ecosystem. A German word, umwelt came about in the 1920’s. It poorly translates to “self-world,” or the observable world of an organism occupying a certain habitat. For instance, since birds fly they occupy very large umwelts that span different ecosystems, whereas a tick that clings to a blade of grass occupies a very small one. Though the word has been bouncing around for a while, it somewhat-recently got ecological treatment in T.F.H. Allen’s Supply-Side Sustainability, a book that suggests what we should sustain, and to what extent. As is Allen’s style, he takes a hierarchical approach to sustainability. He asks questions based on the different criteria of his particular hierarchy—the most useful of these for conservation are defined as organism, community and population—noting that most observations change as the level of analysis changes (as an example, evolution acts differently on an organism than it does on a population). Combining these ideas, we can say that the beavers in the Anacostia and the Salmon in the Kinnickinic survive through the preservation of certain key elements of their habitat. 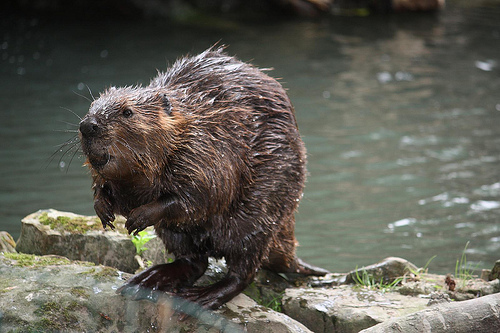 Trash disrupts the beavers umwelt because it reduces fish populations and can prematurely alter the flow of a river. For the salmon, poor river flow and poor visibility affect mating patterns and force salmon to find other sites to spawn. Both are great examples of restoration in action, the confluence of great ideas, hard work and a little bit of luck. Now, the idea of the umwelt does seem to imply that we can protect wildlife by identifying the key parts of the habitat and then rehabilitating them, and there’s some credence to this. If we could preserve wildlife by isolating the most important variables and preserving just those, then what have we really preserved? The umwelt becomes a sort of a habitat-dependant cage rather than a restoration tool. However, as in the cases of both of the salmon and the beavers, proper restoration is difficult to get right on a small scale. We would need enormous amounts of data about certain organisms to begin to assemble a pattern, and the odds of finding the right information are incredibly small. Groundworks Anacostia and the Milwaukee Metropolitan Sewage District only focus on the health of the river, and let natural ecology do the rest. For more on umwelts, check out Allen’s Supply-Side Sustainability as well as Mitchell Thomashow’s Bringing the Biosphere Home: Learning to Perceive Global Environmental Change. For a bad experiment that ignored these concepts, check out Biosphere 2. For more on hierarchy theory and systems science, check out this paper by Allen on the privilege of science in the modern world and read The Structure of Scientific Revolutions by Thomas Kuhn. What constitutes your umwelt? Probably beer. Let us know on Twitter (@midwestbeer), Facebook or send an email to mwbeercollective@gmail.com. This is an interesting and intelligent article, but I would argue your two threads need tying together. I’m not sure I understand this sentence “Trash disrupts the beavers umwelt because it reduces fish populations and can prematurely alter the flow of a river. ” Beaver are vegetarians and don’t rely on fish populations. In fact their dams drastically improve them. The missing variable from the recovery of the stream is the restored riparian border with recovered streams allowing for beaver in the stream allowing for salmon in the stream. The research on this is already evident and repeated, and if Milwaukee wants more salmon, it needs to plant more riparian willow and attract more beaver. Thanks for pointing that out. I forgot to mention that beavers are in fact herbivores, and the presence of fish in the Anacostia is really more an indication of river health rather than a source of food for the beavers. Both of these anecdotes are unrelated except for that they provide simple examples for understanding the concept of ‘umwelts.’ I also didn’t use the term ‘riparian buffer,’ however, this is pretty much what they’re doing in Milwaukee (the movie is a little boring, but it’s informative and shows how Milwaukee is regrowing the areas around the river). Thanks for the feedback, suggestions and most importantly, thanks for reading! There's still more to be explored. Become a Voyageur today and join the conversation. Midwest Beer Collective · There is still more to be explored.